Lagom is the Swedish philosophy of living life in harmony - balancing happiness with moderation and respecting sustainability. This "not too much, not too little; just enough" way of life is at the core of Sweden's food culture and is celebrated in a beautiful new cookbook by Steffi Knowles-Dellner, a Swedish food stylist, cookbook author, and blogger at Always So Hungry. 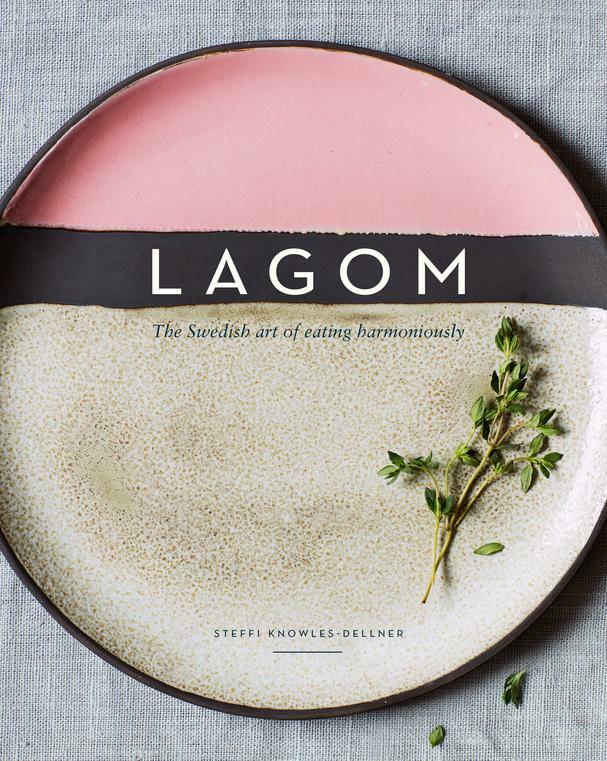 In Lagom: The Swedish Art of Eating Harmoniously, Knowles-Dellner offers simple and elegant meals that are in harmony with the seasons and good for the soul. She gives insight into ingredients, cultures, cooking styles and the way Swedes cook and eat every day in over 100 mouthwatering dishes for every season, occasion, time of day, and appetite. Her recipes are uncomplicated, unfussy, and are created to bring people together. Chapters include Frucost (breakfast), Lättare Rätter (lunches, sides & light bites), Huvudrätter (main meals), Sött (desserts), Bakverk (baking), and Smått och gott (bits & bobs), the latter of which includes a handy section on Preserved Fish where you'll learn how to smoke, salt, pickle and cure like a native Swede. She also offers recipe ideas for cozy Fridays (called Fredagsmys), such as Salmon burgers with crunchy corn salsa, & lime & jalapeño mayo. Discover dishes like Pizzasallad, a crunchy cabbage slaw with a sharp vinegary dressing that Knowles-Dellner says is "totally addictive," and her perfect for weekend mornings Kanel & kardemummabullar (cinnamon and cardamon buns). Her gorgeous Creamy cucumber & dill gazpacho with pea salsa & sumac and her Swedish mint julep with acquavit are sure to become summer favorites. 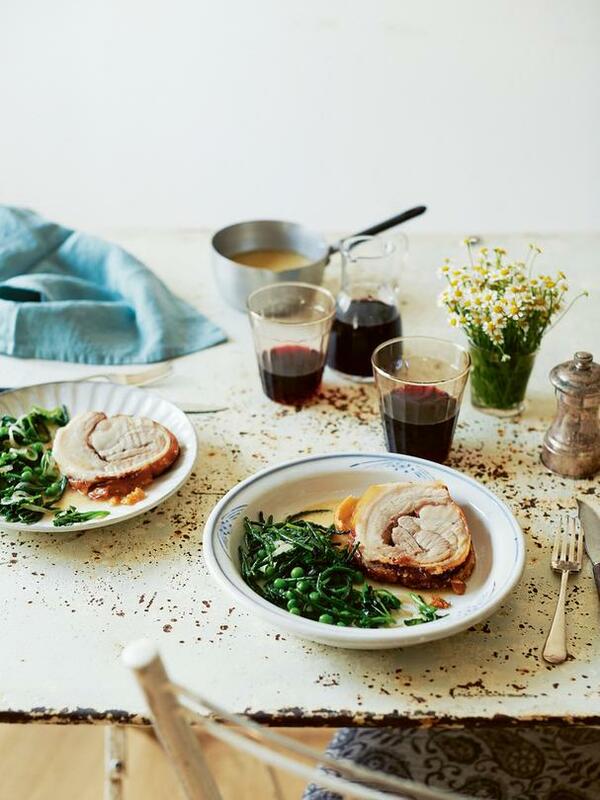 Below are three recipes from Lagom which together make the perfect meal: a tender Milk-braised pork belly with peas, watercress, and samphire (also known as sea beans and are in season now through summer), her lemon-roasted Hasselback potatoes recipe, and for dessert Cardamom buttermilk panna cotta with dried fruit compote (which she refers to as a winter dessert, but I would eat it year-round it's so lovely!). Begin by thinly slicing the potatoes, about ¼ cm (1/8 in) thick. The easiest way to do this is to use a mandoline or the slicing attachment on a food processor. If you are doing it by hand, make sure you have the radio on and a comfortable seat as it will take a while. Place the slices in a large bowl of cold water as you go. Preheat the oven to 200ºC/400ºF. Drain the potatoes and pat very dry. Next, stack the potato slices lengthways and upright in a large ovenproof dish with high sides, about 35 x 20cm [14 x 10in], so the cut sides are facing you. Pack them tightly so that they support each other to form long rows. Mix the olive oil, garlic, lemon juice and zest with the dried thyme and oregano. 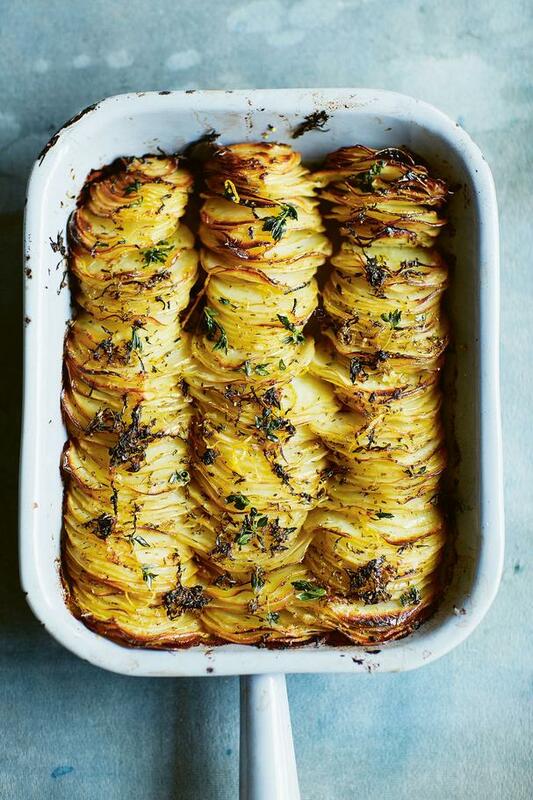 Drizzle over the potatoes, then sprinkle with sea salt and the fresh thyme. Bake for 1 hour–1 hour 10 minutes, until crispy and golden. Cover with foil if the potatoes start going too brown. Be sure to test that the potato slices are cooked through with a skewer before removing from the oven. 150g [5 ¼ oz] mixed dried fruit, such as figs, prunes, apricots, sultanas, cherries, etc. To make the compote, place all the fruit in a bowl and cover with the tea. Allow to soak for 3 hours, or overnight. Lightly grease 4 ramekins or dariole moulds with a little oil, then line with clingfilm as smoothly as possible. Heat the cream in a small saucepan, slowly bringing to a simmer. Remove from the heat and allow to cool a little. Soak the gelatine leaves in a small bowl of cold water for about 5 minutes, until soft and jelly-like, then squeeze out any excess water and add to the cream, stirring to dissolve. Pour the cream mixture into a bowl along with the yogurt, sugar, honey, vanilla seeds and cardamom, and mix well to combine. Divide among the ramekins and refrigerate for at least 4 hours, or until set. Transfer the soaked fruit and tea to a small saucepan, along with the remaining compote ingredients. Bring to a gentle simmer and cook over a low heat, stirring frequently, for 20 minutes, then strain, reserving the liquid. Discard the spices and reduce the liquid until syrupy before stirring back into the fruit. Turn out the panna cottas onto plates, gently lifting off the clingfilm. 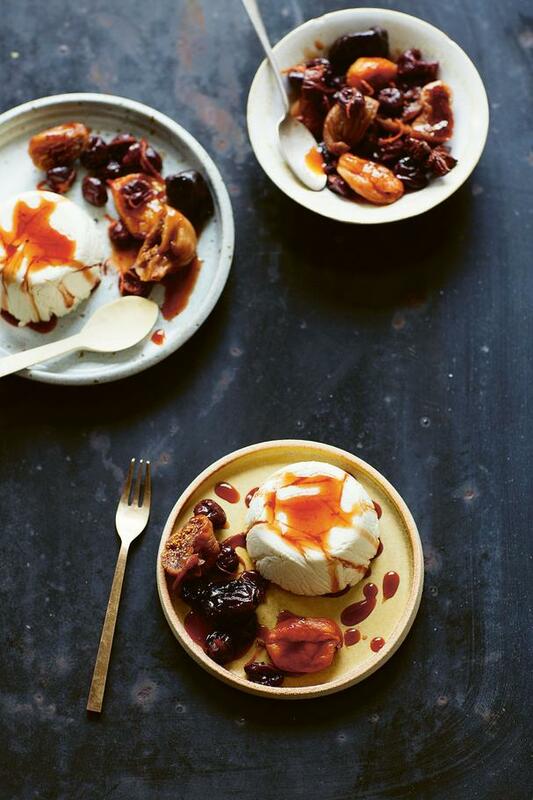 Serve with the warm compote, drizzling with a little leftover syrup. Recipes and excerpts printed with permission from Lagom: The Swedish Art of Eating Harmoniously by Steffi Knowles-Dellner, published by Quadrille February 2018.